Angelique Miles, once a music industry power house, joins Deidre and JG to share “wiZdoms” and insights on reinventing yourself when you simply have no other choice. While change is natural, what happens when we are uprooted and forced to adapt to a new reality? We often dream of a certain future for ourselves, but when we are met with the unexpected, it can be challenging to find success again. This episode, Angelique Miles joins GutwiZdom to share her inspiring story about climbing back to the top after her success in the music industry came to a sudden halt. Overcoming fear and many obstacles, Angelique transformed her lifestyle and took advantage of the opportunity to reinvent herself to find happiness and success. Resilience, Reliance, & Renewal. These are the three emotional components to identify that help us the most when we are forced to reinvent ourselves. Find who you can really trust. In the midst of the storm, find your blessings and identify the people that will truly be there to support you. Remember who you really are. While change and transitioning can be intimidating, don’t lose sight of what makes you, you! Believe in yourself. If you don’t believe in yourself to change, who will? Have the power to know that you can, and you will, reinvent yourself, and find new success. Many materials things can be taken away from you. However, your talent, your YOU, cannot! Have faith in the universe. Everything happens for a reason, so don’t lose sight of the light at the end of the tunnel. Plan your exit. Change will happen; be prepared to adapt and find a new path. You might even want to think about the worst-case scenario and plan for it, while things are awesome! Grab the bull by the horns. Have the courage and the confidence to face the challenges that come your way. Get out there and start acting on what makes you happy! Taking action is always a great remedy to stare fear down. Take control of what you can! 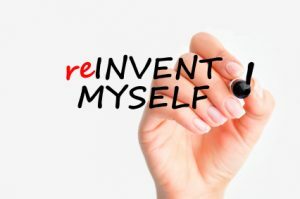 LISTENERS: How will you invent your reinvention? Share your experiences and “wiZdoms” with us! Either leave us a voicemail at 646-653-9278 or send us an email. We may talk about it - or we may even talk with YOU - on the air!